Daniel: I've always been the good son, the good student, living up to my parents' high expectations. Never the poet. Or the dreamer. But when I see her, I forget about all that. Something about Natasha makes me think that fate has something much more extraordinary in store - for both of us. 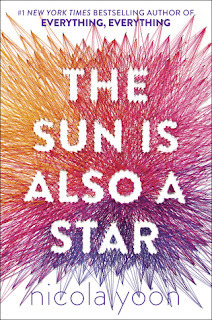 The Sun is Also a Star is not only my favorite book of 2016, but has also earned a place in my list of top 25 favorite books. At first glance, it seems rather ordinary as it's a story about a boy and girl who fall in love in one day. That's been done about a thousand times, right? But I promise this book is far from cliché. 1) Voice, voice and MORE voice. I'm not just talking about Yoon's writing style here, although that in itself is powerful. No, I'm talking about point-of-view voices. Most of the story is told by the two main characters, Natasha and Daniel. But this story also includes the voice of The Universe, a waitress's voice, as well the voices of a few others. You might think this would be frustrating or make the story spin off into pointless tangents, but Yoon pulls it off beautifully. Not only are the chapters super short (Yoon does not waste your time or patience with extra words), but each voice is engaging. The web of people from all walks of life who interact with the main characters during this pivotal day create a full reality of their experience. 2) The main characters are struggling with their different cultural backgrounds in the 'Melting Pot' of the United States. Daniel finds it hard to live up to his parents' expectations of going to an Ivy League school and being fully Korean even though he grew up in America. Natasha who has struggled with the challenges of being an undocumented immigrant for years but is now facing deportation from the only home she remembers - America. 3) And what exactly is love, anyway??? One character thinks it's nothing but chemical reactions that can be ignored. The other believes it's fate. Yoon explores the question of what love is as well as it's power. 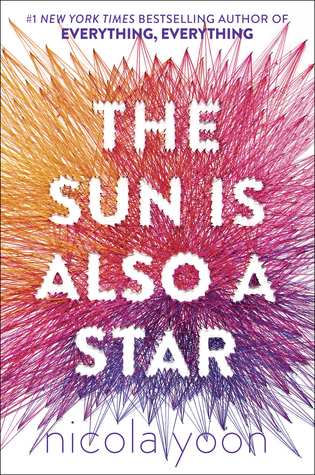 The Sun is Also a Star will mess with your heart. It'll wring it out then make it sing. And then it'll do it again. Maybe several more times. Anyway, grab a couple of tissues and PICK UP THIS BOOK! I just got this book last week and I know I'm going to love it.